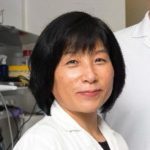 Professor Guiying Nie is an authority on embryo implantation and placental development. Her research focuses on human uterus-embryo interaction for implantation, implantation failure in IVF, placental development and pregnancy complications, particularly preeclampsia. She is also interested in reproductive cancer and non-hormonal contraception. Prof Nie obtained her PhD from the University of Essex, UK, and then travelled to the United States where she completed postdoctoral training at the Brookhaven National Laboratory in New York. 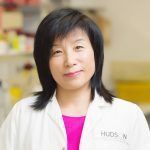 She subsequently joined Prince Henry’s Institute, now Hudson Institute of Medical Research, and embarked on a rewarding career in reproductive biology. Now a Fellow of the Society of Reproductive Biology, she remains committed to research in female reproductive health. Prof Nie works closely with specialist clinicians to address key women’s health issues. Her current research program focuses on developing clinical tools that will enable IVF scientists and clinicians to accurately predict when a woman is most likely to achieve successful implantation, and will also enable them to select the best quality embryos for transfer. Her work also focuses on developing new strategies to diagnose and treat pregnancy complications, especially early onset preeclampsia. Prof Nie’s research has resulted in over 100 peer-reviewed publications, the majority as first or senior author in top discipline-specific or high impact general journals. A sought after speaker, she has presented her work at numerous national and international conferences and is regularly asked to review major national and international grants. She has also served on a number of editorial boards, including a current position on the Editorial Board of Reproductive Sciences. She is an executive member of Australian and New Zealand Placental Research Association (ANZPRA). 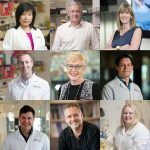 As well as the National Health and Medical Research Council of Australia, Prof Nie receives funding support from Monash IVF, the CASS Foundation and international funding bodies such as CONRAD/CICCR (USA), ESHRE (Europe), Ferring and the Bill and Melinda Gates Foundation. Rolnik DL, Wang Y, Hyett J, Silva Costa FD, Nie G (2019) Serum podocalyxin at 11-13 weeks of gestation in the prediction of small for gestational age neonates. J Perinatol Apr 5. doi: 10.1038/s41372-019-0370-5 (Epub ahead of print). Wang Y, Lim R and Nie G (2019) HtrA4 may play a major role in inhibiting endothelial repair in pregnancy complication preeclampsia. Scientific Reports Feb 25;9(1):2728. Nie G and Dimitriadis E (2018) Molecular and cellular basis of human embryo implantation. In How to Prepare the Endometrium to Maximise Implantation Rates and IVF Success. Kovacs G and Salamonsen L eds. PA: Cambridge University Press, pp 10-18. Wang Y, Li Y, Hyett, J, da Silva Costa F, Nie G (2018) HtrA3 isoform-specific ELISAs for early detection of preeclampsia. Slas Discovery 23: 1092-1099. Lv Q, Yang B, Ning C, Xie B, Nie G, Chen X and Chen Q (2018) Hypoxia is involved in the reduction of HtrA3 in patients with endometrial hyperplasia and cancer. Biochem Biophys Res Commun 503: 2918-2923. Heng S, Evans J, Salamonsen LA, Jobling TW, Nie G (2017) The significance of post-translational removal of a-DG-N in early stage endometrial cancer development. Oncotarget 8(47):81942-81952. Li Y, Salamonsen LA, Hyett J Costa FDS, Nie G (2017) Maternal HtrA3 optimizes placental development to influence offspring birth weight and subequent white fat gain in adulthood. Sci Rep 7(1):4627. Chen Q, Wang Y, Li Y, Zhao M, Nie G (2017) Serum podocalyxin is significantly increased in early-onset preeclampsia and may represent a novel marker of maternal endothelial cell dysfunction (2017) J Hypertens 35(11):2287-2294. Wang Y, Chen Q, Zhao M, Walton K, Harrison C, Nie G (2017) Multiple soluble TGF-β receptors in addition to soluble endoglin are elevated in preeclamptic serum and they synergistically inhibit TGF-β signaling. J Clin Encodrinol Metab, 102(8):3065-3074. Evans J, Salamonsen L, Winship A, Menkhorst E, Nie G, Gargett C and Dimitriadis E (2016) Fertile ground: human endometrial programming and lessons in health and disease. Nat Reviews Endocrinology, 12:654-667. Heng S, Andrew N, Stephens AN, Jobling TW and Nie G (2016) Measuring PC activity in endocervical swab may provide a simple and non-invasive method to detect endometrial cancer in post-menopausal women. Oncotarget 7: 46573-46578. Heng S, Vollenhoven B, Rombauts LJ and Nie G (2015) A high-throughput assay for the detection of a-dystroglycan N-terminus in human uterine fluid to determine uterine receptivity. J Biomol Screen 21(4):408-413. 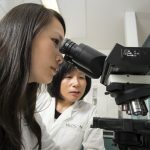 Heng S, Paule SG, Li Y, Rombauts LJ, Vollenhoven B, Salamonsen LA and Nie G (2015) Post-translational removal of alpha-dystroglycan N-terminus by PC5/6 cleavage is important for uterine preparation for embryo implantation in women FASEB 29:4011-4022. Singh H, Nero TL, Wang Y, Parker MW, Nie G (2014) Activity-modulating monoclonal antibodies to the human serine protease HtrA3 provide novel insights into regulating HtrA proteolytic activities. PLoS One 7(9):e45956. Ho H, Singh H, Aljofan M and Nie (G) (2012) A high-throughput in vitro model of human embryo attachment. Fertil Steril 97:974-978. Heng S, Cervero A, Simon C, Stephens AN, Li Y, Zhang J, Paule S, Rainczuk A, Singh H, Quinonero A, Tapia A, Velasquez L, Salamonsen L, Rombauts LJF and Nie G (2011) Proprotein convertase 5/6 is critical for embryo implantation in women: regulating receptivity by cleaving EBP50, modulating ezrin binding and membrane-cytoskeletal interactions. Endocrinology 52:5041-5052. Heng S, Hannan NJ, Rombauts L, Salamonsen LA and Nie G (2011) PC6 levels in uterine lavage are closely associated with uterine receptivity and significantly lower in a sub-group of women with unexplained infertility. Human Reprod 26:840-846. Sing H, Endo Y and Nie G (2011) Decidual HtrA3 negatively regulates trophoblast invasion during human placentation. Human Reprod 26:748-757.